Red Bull Rising: What's in 'The Box'? Fort Irwin, Calif., September 2010: Upon arrival to Fort Irwin, soldiers spend a few days getting ready to go into "The Box." During their time in The Box, soldiers are forbidden to use cell phones and wireless Internet connections. Some units go to the extreme of confiscating all such devices, down to soldiers' MP3 players. Why? Because you can't fight Bad Guys in Burqas while listening to Sir Mix-a-Lot's "Baby Got Back." Soldiers are also denied energy drinks. Fort Irwin trainers are so serious about avoiding dehydration that the convenience stores on post won't sell Monster or Rockstar or Red Bull to visiting "rotational" soldiers. And, during the Red Bull's rotation, they are also denied access to the gut-trucks, roach-coaches, and ice-cream wagons that typically follow soldiers around the training area, like camp-followers of old. The "no-gut-truck" rule is somewhat self-inflicted, an edict from the Red Bull command team. The Iowa soldiers grumble a little about it, but those same Fort Irwin trainers spouting opinions such as "Energy Drinks Kill"? They kick the complaints up to a high whine. "You know, you're going to have that stuff available over at some of the FOBs in country," one says. "And, these are business owners. This is their bread-and-butter." Once soldiers enter into The Box, everything counts. The first week in The Box consists of various "situational training exercises," or "S.T.X." Units are presented specific problems and challenges, like "patrol a village" or "recover a disabled vehicle." The second week is "free play." As in real life, events build on each other. Make friends with the villagers in the first week, and they might tell you some good stuff in the second. Break things and alienate people, and they might shoot at you instead. It's real enough, down to the food served in the village cafe. Rumor has it, if you want to eat with the locals, you can actually eat with the locals. They're grilling burgers. Unless they're naked in the shower or sleeping in their cots, soldiers in The Box wear Multiple Integrated Laser Engagement ("MILES") gear--the Army version of Laser Tag. MILES gear consists of a harness worn like a shoulder-holster, a ring-shaped "halo" that encircles the Advanced Combat Helmet (A.C.H. ), and a small box that affixes to the barrel of the M-4 rifle. Upon sensing when a blank-round is fired from the weapon, the latter emits an invisible beam of light. If such a beam hits another soldier's MILES harness or halo, the MILES gear will electronically chirp (for a near-hit) or sound an irritatingly constant high-pitched tone (for a kill). In a MILES gear universe, death sounds not like a bell, but like a French Fry machine. It beeps for thee. Once you've been "killed," only a combat-trainer referee can turn off the noise. To do so, he or she uses a bright-blue toy called a "God gun." 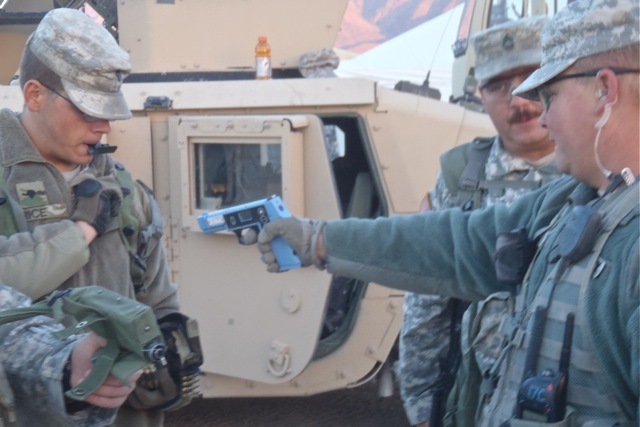 Blue is the color typical of any Army device used for training; a blue land mine, for example, is just like the real thing, except it won't explode. The National Training Center is often compared to a Hollywood movie set. (An NTC commander once described it as "an interactive, combat-focused Broadway play.") There was a 2008 documentary about how NTC simulates Iraq, and, since then, the NTC staff has worked hard to make the environment applicable to Afghanistan, too. The smells, the land, the sounds, the languages are as close as you can get without being there. Some veterans of previous deployments say that, if you wake up enough mornings in The Box, you might have to think real hard about where you are. Older soldiers might compare NTC to something similar to the science-fiction environment of "Westworld." Younger soldiers might compare the experience to an open-narrative, "sandbox"-style videogame. As frosting on the science-fiction cake, all generations will recognize that some of the scenarios are simply not meant to be won. In other words, NTC is Disney World, the Holodeck, and Grand Theft Auto all rolled into one. You come here, and you're getting ready for the real deal. It's like getting called from the minors, up to the Big Show. It's September. It's 100-plus degrees Fahrenheit nearly every day. The troops have been mobilized for nearly two months. After The Box, at least one battalion will leave directly for Afghanistan. The Red Bull came to play. Start the game. Want to see a glimpse of action in The Box? Click here for a recent text-and-video report from the KCRG-TV9/Cedar Rapids Gazette regarding the "worst-day in Afghanistan" scenario faced by many Red Bull soldiers in September: "Afghanistan Simuluation Prepares Iowa National Guard Soldiers for War." When I trained at Ft I, with my old Combat Eng unit, we assigned one guy the job of just making sure the gusy working had cold water to drink. We still worked when it was 116 degrees because our commanders were trying to prove how great they were...so I came up with a plan where we stopped work every 45 min and drank water--Ice Cold Water! Our platoon got more work done than the entire batt, and we had no heat losses. 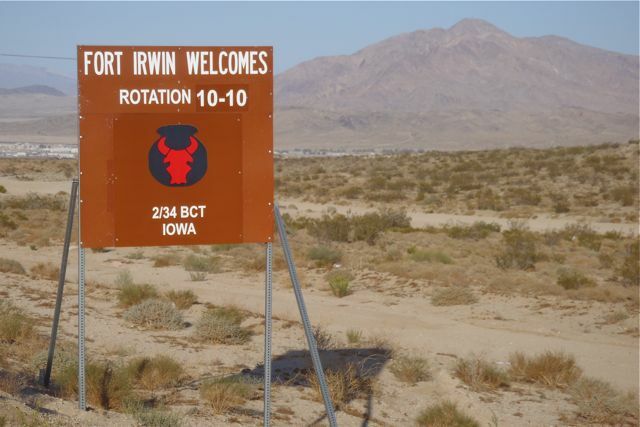 @ CI-Roller Dude: I'd forgotten that Fort Irwin was in your neighborhood (and past)! Oh, and I've got a story similar to yours from my own Fort Irwin observations. I'll see if I can work it into print sometime soon!